Manila, Philippines - The hit reality program "Pinoy Big Brother (PBB) All In" has named the second set of housemates that are in danger of elimination in a live episode on Sunday night, May 18, 2014. Four housemates including Manolo, Axel, Aina and Michele were nominated for eviction on Saturday, May 24. 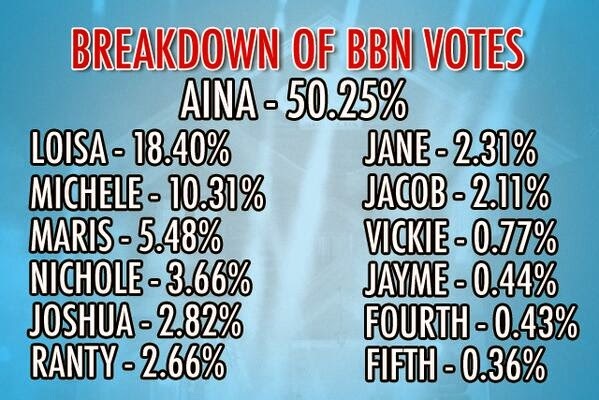 Aina Solano, dubbed as the "Dancing Bombshell ng Boracay" was the first one to be nominated as she garnered 50.25 percent of the total votes from home viewers through Vote to Nominate (BBN). Michele Gumabao, also known as the "Spunky Spiker ng Quezon City," was the next housemate revealed on the list through standard voting as as she garnered 8 points from her fellow housemates. Michele is a former star of the DLSU Lady Spikers, with an MVP award for Women’s Volleyball under her belt from the 75th UAAP Season. Meanwhile, housemates Manolo and Axel are automatically nominated for next eviction due to violation of Big Brother house rule that no housemate shall talk or ask about the outside world. Big Brother on Saturday night announced the violation of Manolo, Alex and Axel. Alex is excluded in the official list of nominated housemates since she is a houseguest. The second nomination night of PBB once again rules online conversations with '#PBB2ndNomi' and 'Bye Aina' topped Twitter trending list.